The TEMPEST competition style portable basketball goal is designed for fieldhouse, gymnasium and upper-end recreational or church use, where there isn't quite enough room for the longer extension Hurricane. The Tempest�s massive extension arm features an upper and lower boom support which is the same design used on the longer extension boom found on the Hurricane. 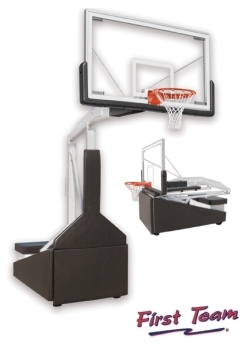 The extension distance from base to backboard on the Tempest is 66� requiring less OB space. The unit comes equipped with First Team�s top of the line FT235 Unbreakable 42�x72� competition tempered glass backboard, FT196 Full-Tilt� 180� breakaway goal and FT72C TuffGuard� bolt-on backboard padding. These are the same components used in high schools and colleges throughout the country. The Tempest is also height adjustable. Rim height adjustments from 10� down to 6� are made easily with its �Spring-Aided� design. To adjust, simply pull the pin located on the adjustment rod, raise or lower the unit as needed and replace the pin. One person can easily roll the unit into place and set up quickly and easily. Choose the Tempest Triumph-FL package for installations on floating floors or Tempest Triumph-ST for all other flooring surfaces. All Tempest portable basketball goals are covered by First Team�s unmatched Lifetime Superior Warranty! FREE lettering on padding with purchase of Hurricane, Tempest, Storm, Thunder or Fury system!